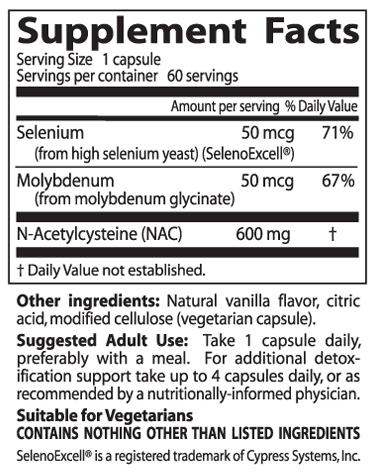 NAC is a premier antioxidant, antitoxin, and immune supporter. As a potent antioxidant free radical scavenger, NAC plays a crucial role as a protector in the defenses of the body's cells, tissues, and organs. It also supports proper lung function and may have the ability to chelate heavy metals, such as mecury. As a powerful antioxidant, NAC neutralizes free radicals which are produced by normal metabolic activity. When free radicals are left unchecked they cause damage to cells and DNA and are considered by scientists to be a major factor in the aging process. NAC has also been shown to play a protective role against a variety of toxic hazards such as cigarette smoke, auto exhaust, certain herbicides, and overdoses of acetaminophen. N-Acetyl Cysteine (NAC) is the pre-acetylized form of the simple amino acid Cysteine. A powerful antioxidant, a premier antitoxin and immune support substance, and is found naturally in foods. It is a precursor for glutathione, an important antioxidant that protects cells against oxidative stress. In addition to maintaining intracellular glutathione levels, NAC supplementation has been shown to suppresse cell damage caused by chemotherapy and radiation therapy, to be immune enhancing, to protect against toxins as acetametaphen and other drugs, mercury, lead, and others, and is mucolytic, that is, it breaks up mucus seen in bronchoulmonary disease as cystic fibrosis, chronic bronchitis, asthma, and pneumonia. NAC may also protect lung tissue through its antioxidant activity. NAC helps the body synthesize glutathione, an important antioxidant. In animals, the antioxidant activity of NAC protects the liver from the adverse effects of exposure to several toxic chemicals. NAC also protects the body from acetaminophen toxicity and is used at very high levels in hospitals for patients with acetaminophen poisoning. It has also been shown to be effective at treating liver failure from causes other than acetaminophen poisoning (e.g., hepatitis, and other drug toxicity).